Merry Meet my friends. I hope this post finds all of you and yours well and happy. I have been away from my blog and writing for many months. To write why is very difficult but I felt it was time. I’m writing this as part of my healing process and hope that you all will understand my need to do so. This is my beautiful daughter Sara. Sara passed away October 20, 2017. She was my heart, my brave, kind, generous, darling oldest daughter. Her death came unexpectedly and shockingly on the day it occurred. Though we knew she’d lived beyond all expectancy, and over the last few years had become more frail….we were not prepared to lose her and it hurts beyond belief. Let me tell you a little bit about her. Sara was 35 when she passed away. At the age of 6, we were in a terrible car accident that left her a quadriplegic, from the neck down and dependent the rest of her life on a ventilator to breathe 24/7. She could only move her eyes and face. We had to read her lips when she spoke. She had multiple surgeries in the beginning to repair all the damage to her body, but her mind was sharp and intact. We brought her home after several months in the hospital and there she stayed with the help of home nursing care, wonderful nurses (friends) over the years and with me, her constant caretaker. Now you would think that sounds very sad and it was. But over the 29 years she survived each day in that condition, she went to school graduating with honors. We lived life as normally as possible. She went everywhere with us. Whatever it was, we found a way. She’s been in the mountains and on beaches. She shopped, traveled, saw movies and broadway shows, museums and bookstores. She read with a passion. She was a collector of fairies, nutcrackers, keychains, and souvenirs. She journaled her life every day. She adored our pets, her niece and nephews, her sister, brother-in-law, extended family and myself and her dad. She was kind, considerate, so very patient. She was a worrier about everyone but herself. She was a Nature lover, a healer, a keeper of secrets and had a smile that lit up a room. Everyone said she was an angel on Earth and I too believe that was true. She was a one- of- a- kind spirit. No one who knew her will every forget her. Or the lessons she taught us. As her mom, I couldn’t be more proud of the person she was. And as her mom and full-time caretaker, my life has been drastically changed with her loss. She is greatly missed, but my Path tells me she is with our Goddess, in Summerland, whole and happy and well again. My other daughter Kate and I picture her with our rainbow pets, in her huge library comfortable and happy, having tea with our ancestors and waiting for us. This comforts us greatly. I wish you could have known her. You would have loved her as we did. So now, nearly 6 months later, life moves on. I miss her constantly, light candles and incense every day for her. I write notes to her and send them off with fire, smoke and ash. Every holiday, birthday, family event without her is hard. But we remember her and can smile now. Talking about her is good for my family. As Spring arrives (very slowly here in Ohio) I plan a memory garden for her as she loved the outdoors, watching the birds, butterflies, seeing the flowers grow. A dear friend is sending rose bushes in her honor, another a beautiful fairy wind chime, and I’ll plant her favorite flowers as well….sunflowers. Another friend has given us a gift card to plant a tree in her honor. All these things will be done. So now I’m learning my new “normal”. I am doing okay as time marches on. I’m about to turn 60 and because of being her 24/7 caretaker there were many things that I couldn’t do easily. Even taking a walk, or planning an outing etc were difficult at times. I would have kept doing that to my dying day…..but now that she has gone before me, I’m trying to find my way to care for myself for a while. To do things I wasn’t able to do before. To find “me”! What do I enjoy? What makes ME happy. My hubby and I have plans for some travel I think. I’m probably going to get a job at some point. But for now, I heal, rest, do things that make me happy, work in my home, my journals, my planners, my crafts. Dream of my garden beds, walks in the park, books to read and my Path to follow. I do my best to remember Sara is always with me in Spirit and I know she’d want me to be happy and do for myself. And of course, I have my other daughter, her husband and 3 beautiful grandchildren who need me, and my husband and extended family. And I have my sisters in spirit, close friends who surround me with love and concern, and despite losing my darling girl, I know I’m blessed. So, thank you for letting me talk about my girl. Hold your loved ones close as you never know what a day will bring. I’m hoping to write more here again. Perhaps some writing will help me to continue to heal and put one foot in front of the other. Beltane comes soon… and Spring! May Goddess bless each of you with great love in your lives. The love, even when lost, remains forever. The Wheel Turns to Ostara 2016……..
Merry Meet my friends! I have been terribly re-miss on writing here in my blog and I’ll tell you why shortly. It’s a cloudy day, and warmish, hitting 60* right now. Earlier the Sun was out and there was a gorgeous crescent Moon last night to enjoy and draw energy from 🙂 Rain is coming in later..which we DON’T need! Our backyard is flooded! 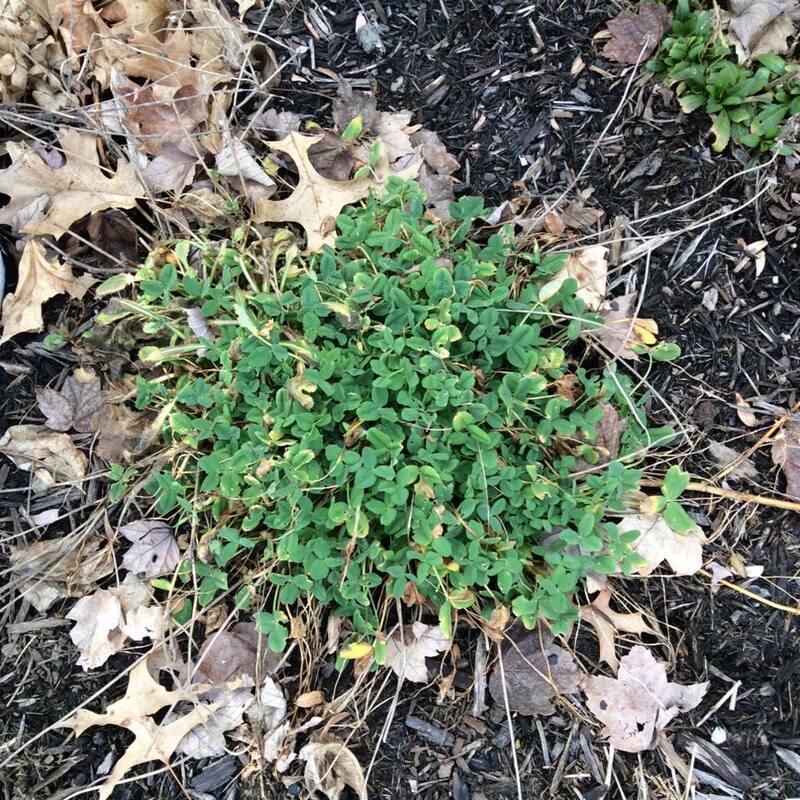 But there are signs of Spring everywhere in our yard. From the animal and bird activities, to the greening of the grass, and the shoots popping up out of the ground from lots of our flowers and herbs! I love it! 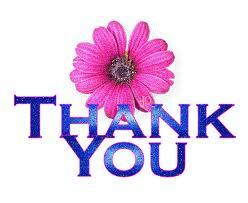 First of all, I want to say thank you so much for being a reader and a friend of this blog. I just celebrated my 6th year writing here. I started out thinking it would be a way for me to keep a journal of sorts. But it evolved into something more over time. I have had over 207,000 views and nearly 780 followers. It’s amazing to me that anything I have to say is of interest to people. And yet, it seems some are interested and I really appreciate it 🙂 I keep it mostly because I enjoy writing, and I enjoy sharing, and I enjoy learning too. So thank you very much! I hope my readers continue to enjoy what I write. Secondly, I have had a rough few weeks. I had surgery on Feb 1 as I believe I talked about a bit in my previous posts. That surgery was a nightmare. It did not go well. Something I won’t go into was done in a way that a nerve was damaged. I was in extreme pain..I mean truly excruiciating with no relief except when I laid perfectly still. Long story short, a week later I was in the OR again having that fixed. The excruciating pain was relieved mostly, but the pain of two surgeries is just now starting to alleviate. I’m told to expect another month or so to feel normal again. I am glad that the original health issue is fixed…but it’s been a heck of a recovery. Funny..I told myself while I was laid up, I’d be reading, writing, and working on a couple projects. But I found it was hard to focus on all of those things. Thus, the lack of writing here in my blog. But I’m reading and journaling and yes, now writing here too now. Thank you for your patience! There is much going on! Ostara is next Sunday! I’m blessed that a dear Witch sister is coming to stay with me for a few days. Deb has been a friend for years now but she lives in SC and we have only met face to face once..and that was way to brief of a time and quite some time ago. We talk on the phone all the time and I look forward to having her within hugging range for a change. 🙂 My coven will gather for Ostara Sunday morning and she will be here for that as well. Everyone is looking forward to meeting their long- distance sister! We will do a ritual, have brunch and a fire. It will be magickal and filled with love! Breakfast casserole, muffins and pastries, fruit salad, coffee and juices are on the menu. Yum! My Spring cleaning was delayed due to the surgeries, but I had worked very hard on serious purging and organizing beforehand. I’ve started back up again the last day or two. I’m down to one cupboard, one closet and a couple kitchen cupboards to go thru yet. It feels so great to do this. Purging unwanted, unneeded, and unused items is very freeing 🙂 It won’t be long and my clothesline will be up again, and clothes, linens and so on will be flapping in the sun and wind! I love that! I’m going to go ahead and post a couple of recipes for Ostara, since it’s here so fast! I’m going to be very busy this next week getting ready for our gathering and for my dear company coming, so I’m not sure I’ll be back to write until after. Foods for Ostara are: Leafy green vegetables, sunflower and pine nuts, dairy, fish, hot crossed buns, sweet breads, hard boiled eggs or eggs fixed any way, honey cakes, and seasonal fruits. Here’s a couple recipes that should fit right in there! Preheat oven to 350* Grease and flour a 9 inch square pan. Combine the flour, baking powder, salt, cinnamon and orange zest. Set aside. In a large bowl, cream together the butter and 3/4 cup sugar until light and fluffy. Beat in the eggs one at a time. Beat in the flour mixture alternately with the milk, mixing just until incorporated. Stir in the walnuts. Pour batter into prepared pan. 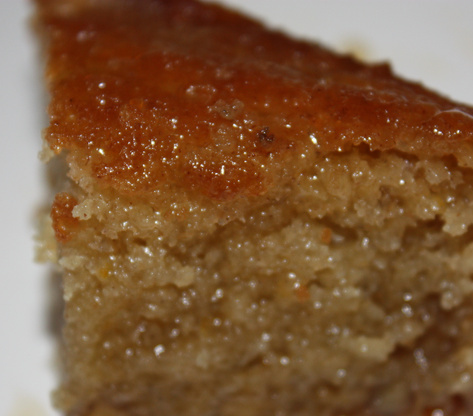 Bake in the preheated oven for 40 minutes, or until a toothpick inserted into the center of the cake comes out clean. Allow to cool for 15 minutes. Cut cake then Pour honey syrup over the cake. For the Honey Syrup: In a saucepan, combine honey, 1 cup sugar and water. Bring to a simmer and cook 5 minutes. Stir in lemon juice, bring to a boil and cook for 2 minutes. 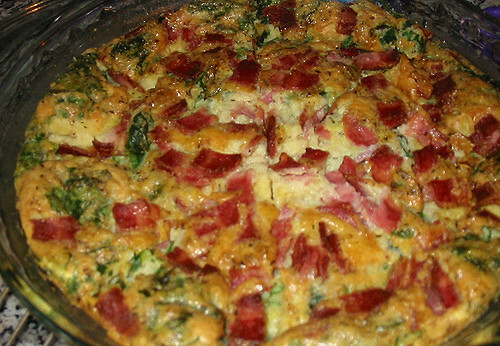 In a large bowl, beat eggs; whisk in milk, 1 cup cheese, onion, bacon, salt, mustard and paprika. Add spinach. There you go…something sweet and something savory 🙂 Enjoy! 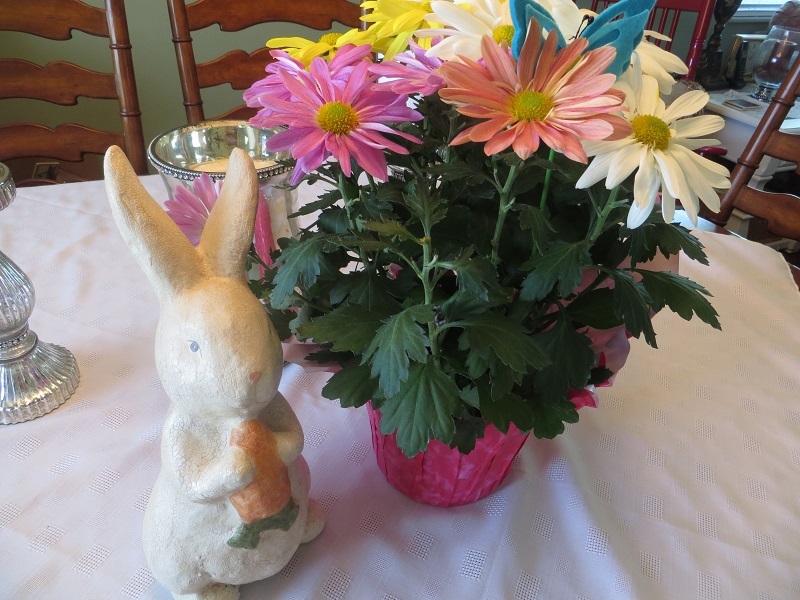 I want to wish you all a very happy Ostara….happy Spring…..and have a great week! Oh, Happy Irish Day as well this week! 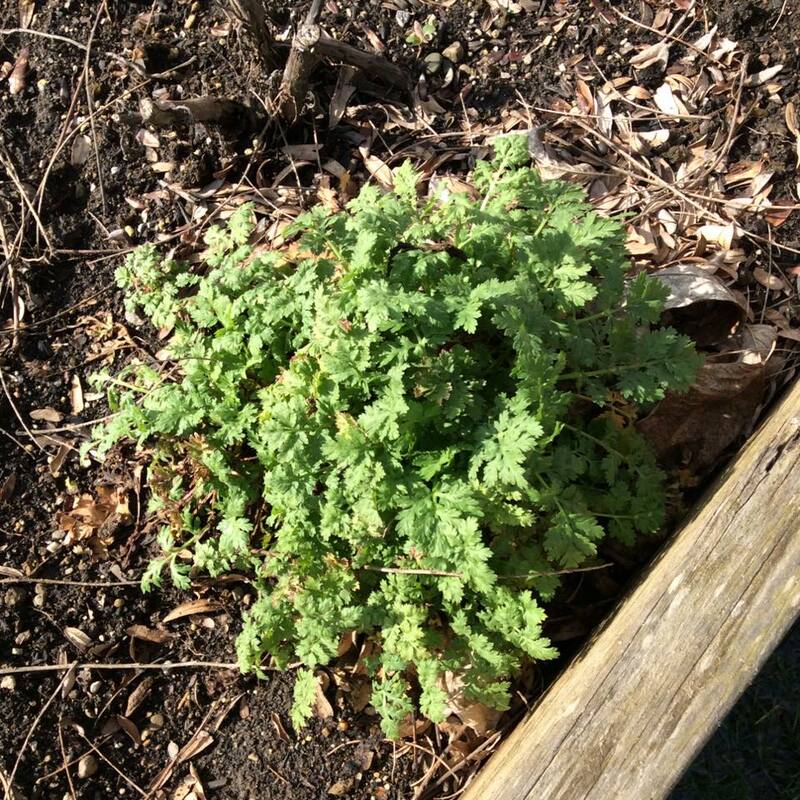 It’s a fun week for seeing green…whether it be in your garden beds, or your Irish showing! Slainte!! The Wheel Turns to Mabon 2015 (Autumn Equinox) ………. Merry Meet! It’s a beautiful Sunday afternoon here in Ohio. While last week we had very HOT weather for September, this week we are having lovely days of seasonal, Autumn-like weather. Today the Sun is bright, there is a light breeze and we have some leaves starting to change color. The garden beds are pretty well done, except for the Fall plants like sedum, hydrangeas, mums and such. The birds are still content at the feeders, I’m still seeing hummingbirds, bees and butterflies, but the squirrels and chipmunks are busy collecting now. 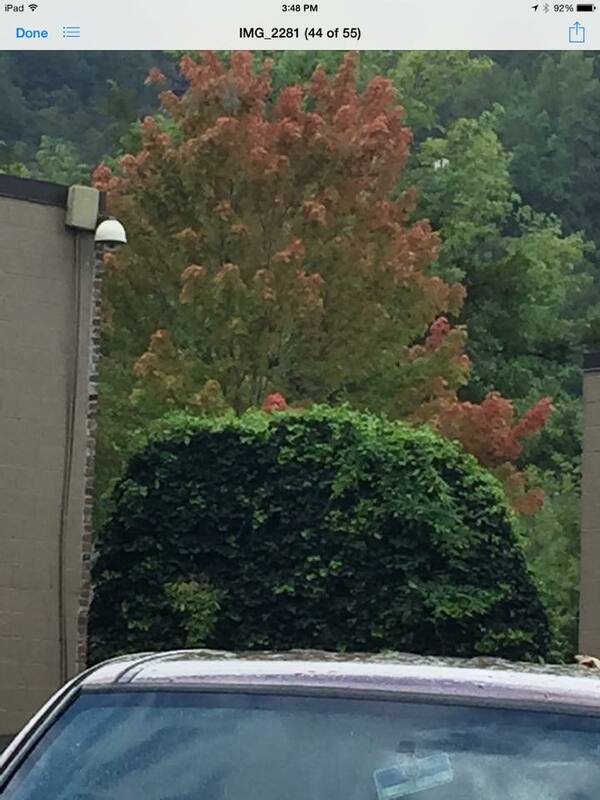 Autumn is on the Air for sure. I have been busy in my garden beds, cutting back the spent flowers, harvesting the last of my herbs, and planning to plant my Spring bulbs next month. Cutting back what was once so beautiful and gave me such pleasure, is a little bit sad. However, I know that Spring always returns and I just enjoy the process, the scents, my hands again in the dirt. 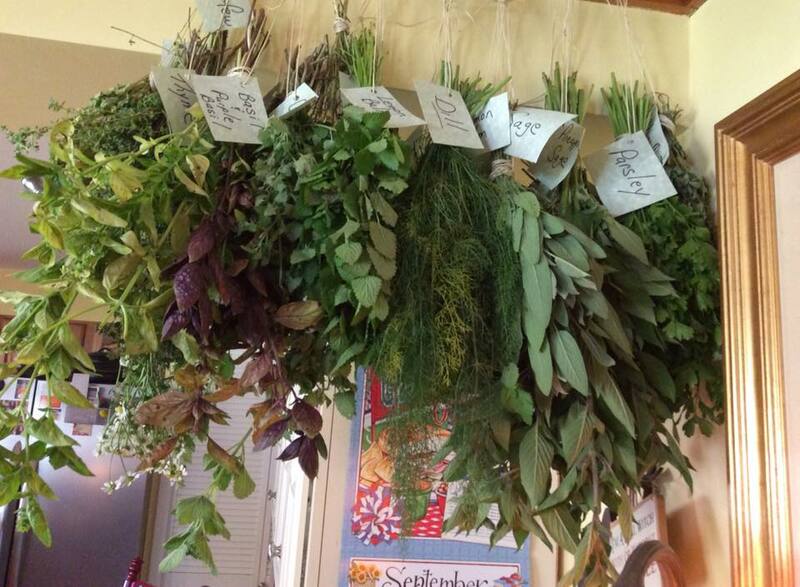 My herbs hang happily drying, and scenting my kitchen with the amazing scents of spice and mint and the green outdoors. Sigh..I just love it! 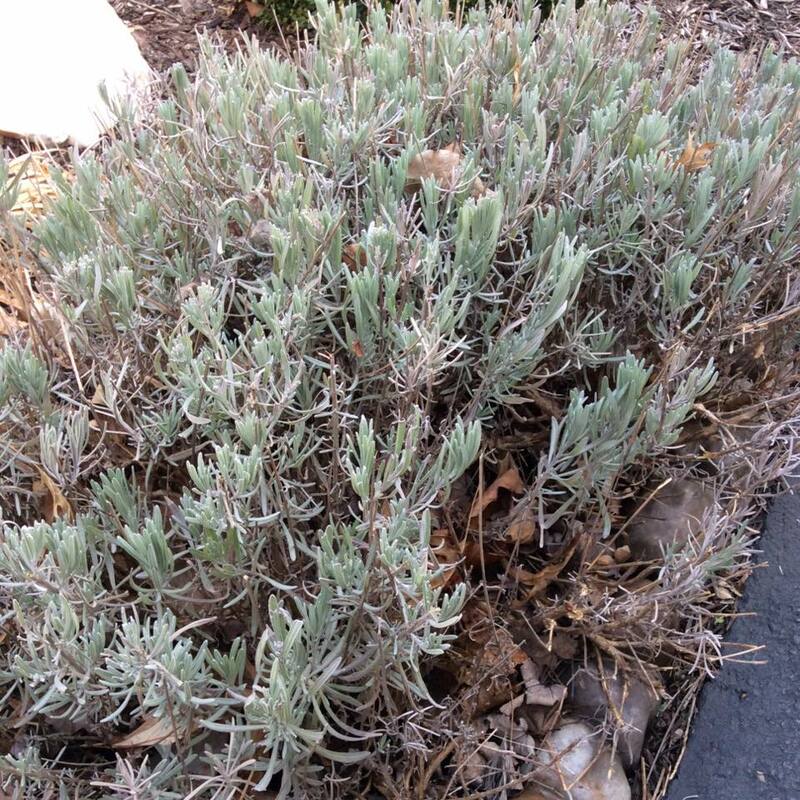 They will continue to give me joy throughout the Winter as I make my tinctures and teas and incenses. The abundant harvest gives me great pleasure and pride in the work I did over the Summer. My last herb harvest happily in place! Mabon is upon us, the Autumn Equinox, on Wednesday the 23rd. It promises to be a beautiful day here. There will be equal day and night and then our days start shortening, our nights lenthening. We come into the dark season of the year. This is a good thing for many who love this time of year. Many of you mourn the loss of the warmth of the Sun, being outdoors constantly and the long days. I feel for you if you are one of them. Way deep down I do lol, but I’m very happy for those like me! For me, Autumn, Winter and the dark time of the year is the best time of year. As Mother Earth ages into her beauty of the season with the brilliant color of her foliage, as her green grass turns gold then brown, as her trees grow alive with color then down to bare, stark trees, it reminds me that is time for me to enjoy the lovely, last days outside, and prepare to come indoors for the long, dark, cold nights. 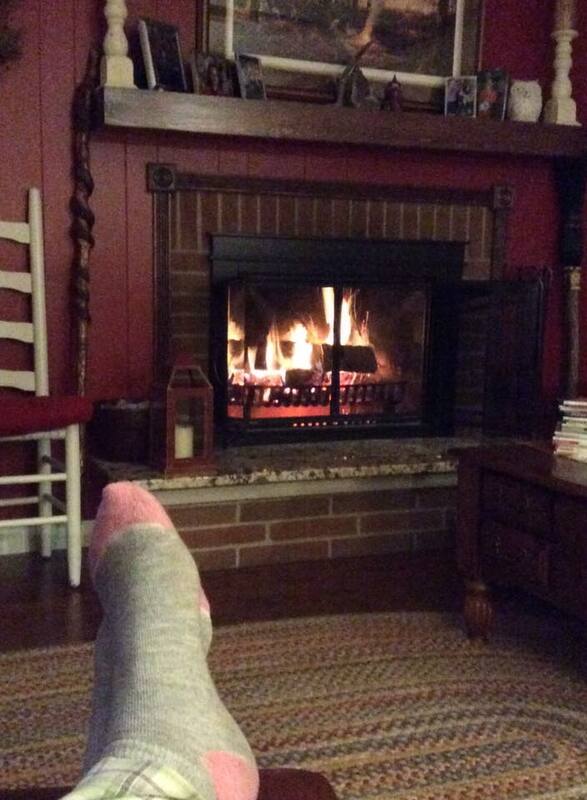 I love the comfort of home, a fire in the hearth, the feel of warm, cozy, dark nights. Winter will be here soon and there is much to do to prepare for it. 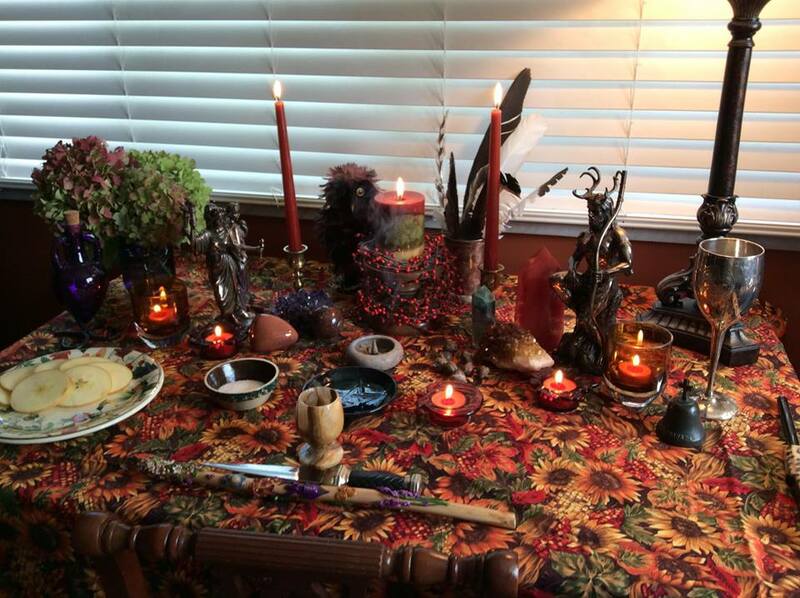 My coven has decided not to meet for Mabon this year. Instead, we are going to attend our local Pagan festival together. I think it’s so important to support our community by attending. Some of us have been before and report a good time had by all. Those of us who are attending for the first time, are really looking forward to it. I haven’t attended yet because I’m usually out of town that weekend. This year, I made sure I’m in town to go. I look forward to communing with those who walk the same Path as I. Do you attend your local events? If you haven’t, perhaps this is a good year to do so! I’ve been perusing my recipe books and will be back, maybe tomorrow with some Mabon recipes. In the meantime, you can search Mabon or Autumn Equinox in the search box on the right to get previous years recipes. There are some excellent ones. You can also find Mabon recipes on the Sunday Stew…see the link on the top right to go there. For my readers, if you want to see what Samhain’s Sirens is all about, just click on the link on the right for a month of Samhain fun..from my recipes to some wonderful crafts, blog posts, music, great give-aways and so much more. It’s a gift to the Pagan community from some very dedicated witchy writers. You will love it! So I’ll be back in the next day or two with a recipe or three. 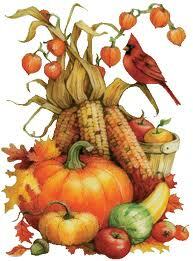 In the meantime, enjoy these last couple of days of Summer, and prepare for another wonderful harvest celebration! May the Goddess bless you on this day and always.